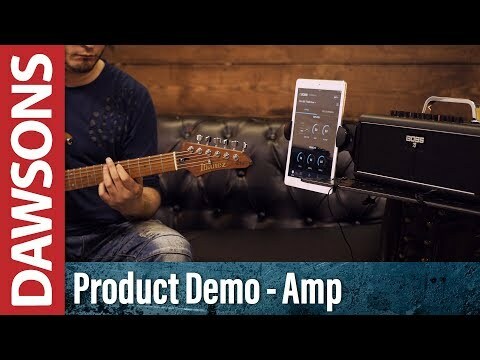 The BOSS KATANA AIR Wireless Guitar Amplifier Combo continues the pioneering path forged by BOSS, by introducing the world's first completely wireless guitar amplifier. Bursting at the seams with innovative features, the KATANA AIR is perfect for practising at home, jamming with friends, or simply taking out and about to jam wherever and whenever you like. Offering the ultimate in playing convenience, the BOSS KATANA AIR sets the new standard in how you play. The BOSS KATANA AIR is built to the same high standards we've come to expect from the tech giant, with a powerful sound engine delivered via flawless wireless connectivity. The corresponding transmitter plugs directly into your guitar, and interacts with the amplifier seamlessly. The low-latency digital wireless guitar technology created by BOSS, ensures that the subtle nuances of your performance are transmitted in all their glory. With indicators for power and battery status, you can rest assured that you're always on top of things. The docking port on the amplifier charges the transmitter's battery conveniently, and a single charge provides up to a whopping 12 hours of total playing time! When not in use, the transmitter and amp will automatically switch over to standby to preserve charge and save energy. When you want to play again, you don't need to switch the amp on. Simply pick up your guitar, and unique motion sensor technology will activate the amplifier, and you're good to go! BOSS have spared nothing when it comes to having versatile built-in tones to choose from. There are five-amp characters for you to choose from, taking in glassy mids with sparkling clarity to BOSS's high-gain brown sound, a monstrous onslaught of epic proportions. There is even a specially voiced character that is best suited to electro-acoustic guitars. There are over 50 BOSS effects to choose from that take in modulation, delays, and reverbs, which have all been optimized to work best with the KATANA AIR's sublime stereo speaker system. There are six onboard memory banks that allow you to save, store, and recall desired settings whenever you wish. The KATANA AIR is equipped with Bluetooth operation, which allows iOS and Android devices to connect to the amp with ease. Therefore, the BOSS Tone Studio app can be used to adjust the amp's panel control, as well as accessing effect's types and routing that are exclusive to the app. A host of advanced features and settings are also available from BOSS Tone Central, including free patch collections. The BOSS KATANA AIR is a sublime true stereo amplifier with a pair of custom-tuned speakers that deliver up to 30-Watts of power when playing via the included AC adaptor, and 20-Watts of power when playing using batteries. Thanks to Bluetooth connectivity, you can play along to your favourite songs or backing tracks - or simply chill out and listen to some tunes. There is a stereo headphone/recording output with guitar cab simulation, which allows you to either practise in silence without bothering the neighbours in the wee hours, as well as recording professional-quality amp tones with effects via your DAW of choice. You can even adjust the cabinet simulation's mic position with the Air Feel control in the BOSS Tone Studio app, for greater control over your recordings. * When using batteries having a capacity of 2500 mAh. Posted on 21/03/2019 by Lucien The overall sounds on this little thing are impressive. You can get some pretty decent overdriven blues tones and straight up metal tones and the clean sound is very good. The effects really allow you to hone the sound. The ability to play backing tracks directly through the amp is a great feature as is the wireless function. It's ideal for my purposes - home playing as and when. Used as solely a speaker to play music is its weakest point, the sound isn't great and there's definitely better products around for bluetooth music playback. But as an overall package - really pleased.